Magic League is a fun, on-demand Magic play experience aimed at all skill levels. It's easy to jump in and play, making Magic League a great entry point for new players while still appealing to veteran players thanks to its flexible and fast play structure. Players build an initial 30-card minimum deck from two booster packs of Hour of Devastation and 1 pack of Amonkhet. You will then have the option to purchase and add to your card pool either 1 booster pack of Hour of Devastation or 1 bookster pack of Amonkhet each week and 1 pack whenever you lose three times. 1. The league runs over four successive weeks (July 17th - August 13th). 2. For the entry fee of $15.00, you will receive two booster packs of Hour of Devastation and one booster pack of Amonkhet, a collection box, and a match card. 3. Build a minimum 30-card deck from the three boosters and play as many matches as you like. There are two special rules: matches should be just one game, and each player may take one free mulligan per match. 4. 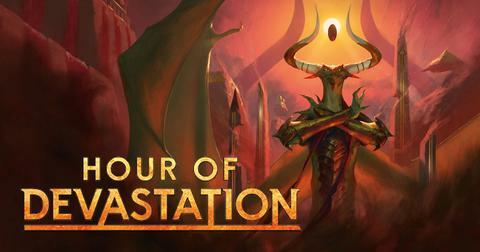 You will be able to purchase (at $3.99 a pack + tax) an additional Hour of Devastation booster or Amonkhet to add to your card pool each week (on Saturday) and after every three losses. You play as many matches as you want. Additionally, there are no structured pairings. You can play whenever you want and against anyone in the league. 5. We encourage Magic League play outside of our dedicated "Saturday League Night" as well, including at Friday Night Magic. Games play fast, so they're great in between rounds of other events. 6. We will issue rewards at the end of the league. Rewards will vary, but we will have things like rewards for 10+ wins and for accomplishments like "most improved" or "most new players recruited." 7. We will allow a player to "catch-up" if they join the league late. You will be able to purchase additional booster packs you may have missed from previous weeks. With a low barrier to entry, quick matches, rewards for actions other than winning, enabling players to choose their opponents, and no structured rounds or tournament all lend to friendly, constructive play—makes Magic League a great training ground for newer players.